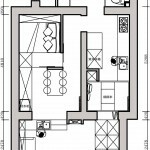 Renovation projects for family of three people and family for three generation’s with the floor area of 28 sam and 40 sqm. 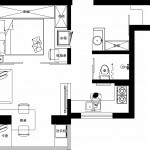 Under the pressure of crazy housing prices (and people have to pay for the shared area) and crowded traffic in Beijing, numerous people have to live in tiny apartments in center city without any other choice. And most of them are three or even four generations’ family. 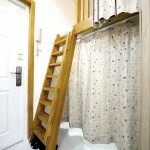 It is a challenge to have a comfortable living condition in a limited area with dignity. Local designer Luo Xiuda successfully solves the problem. 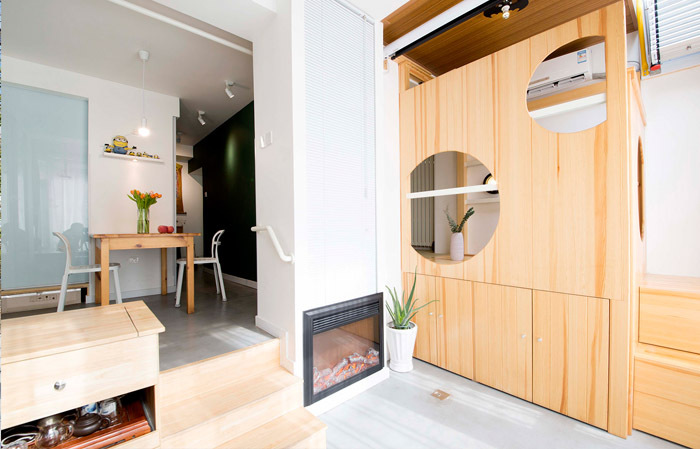 The two projects of tiny apartments, one is a 28 square meter house for a family of three people, the other is a three generations’ home of 40 square meter. The existing bedroom could be transformed into two bedrooms, one dining room, children’s playing area, reading area and a crawling space for 2 cats. 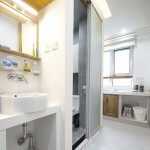 ▼将各个封闭空间改成现有的开放式或半开放式空间，The existing closed spaces are transformed into open or semi-open spaces with different level of privacy divided by circulation. The first project with a construction area of 40㎡, and the floor area is 28 ㎡. The client has previously lived in an 110m2 house and he wants the living quality to be the same in this much smaller space. The existing bedroom could be transformed into two bedrooms, one dining room, children’s playing area, reading area and a crawling space for 2 cats. The original house is too small with closed and crowed spaces. In addition to that, the circulation is too long and is a waste of space. Restroom and entrance area are in bad lighting conditions. The house is for a family of three people and two cats. 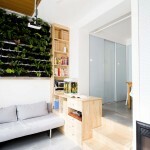 Designer takes advantage of the 2.8 meters floor height to expand the space. 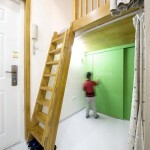 A mezzanine separates the entrance space, the upper part houses a children bed while the lower part is a storage room. The existing closed spaces are transformed into open or semi-open spaces with different level of privacy divided by circulation. Designer aims to place more storage spaces on the wall including the hanging stepped bookshelf where cats could play, TV wall and CD cabinet in living room. As for the color scheme, the background color is white, raw wood color is mainly used in the space with a balance of light grey, grass green as a decoration, giving the whole house a natural palette sense. Designer aims to avoid material pollution by minimizing the use of glue and paint. 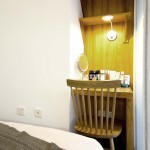 The main materials are solid wood, wood oil, metal and glass. Designer is satisfied with 3 aspects. 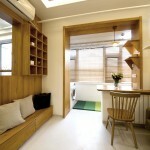 Frist, as space renovation, the new circulation and the children’s bed are suitable for the house. Second, with the frequent use of frosted glass, designer created an ambiguous, gentle and elegant atmosphere. 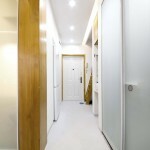 Finally, the small house successfully meets the demands of client’s family and they a living an enjoyable happy life now. Family members are getting closer in small open space. 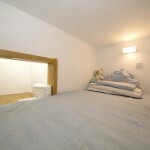 Both parents and little child get to have their own privacy spaces. 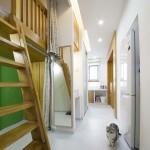 ▼在客厅处做了隔层，上部分为儿童床，下部分做储物间，A mezzanine separates the living area, the upper part houses a children’s bed while lower part is a storage room. 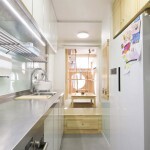 The second project with a construction area of 50㎡, and the floor area is 40 ㎡. The client requires that the home should hold three bedrooms and two halls with one kitchen and two bathrooms. The original house is too narrow and small for living. 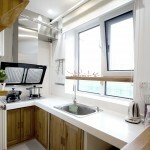 The kitchen is only 2 square meters and the restroom is only 1 square meter. 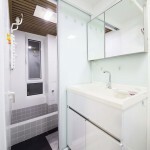 There is no space for refrigerator, washing machine, shower and washbasin. The house is for a three-generation family with 4 people. 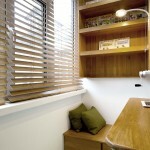 Designer digs down 60 cm at the balcony area in order to have a 3.1meter floor height. 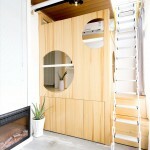 A mezzanine separates the living area, the upper part houses a children’s bed while lower part is a storage room. 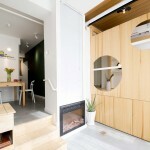 The existing closed spaces are transformed to open and semi-open spaces with a sense of privacy. Designer aims to place more storage space on the platform including the platform beds in master bedroom and secondary bedroom. As for the color scheme, the background color is white, raw wood color is mainly used in the space with a balance of light grey, giving the whole house a natural palette sense. Designer aims to avoid material pollution by minimizing the use of glue and paint. The main materials are solid wood, wood oil, metal and glass. Designer is satisfied with 3 aspects. 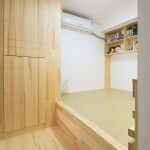 Frist as space renovation, the new circulation and the children’s bed are suitable for the house. 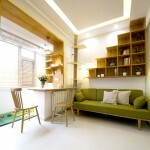 Second, with the use of color scheme of white and wood color, designer creates a natural, gentle and elegant atmosphere. Finally, the client’s family has a happy and harmonious life in the new home. They enjoy dinner cooked in the open kitchen everyday.